First, is a bent piece of clothes hanger, or spoke into a u-shape. Put this between two links of your chain to create some slack links. This way when you remove your link-pin (or quick-link), the chain won't slap back due to derailler tension. 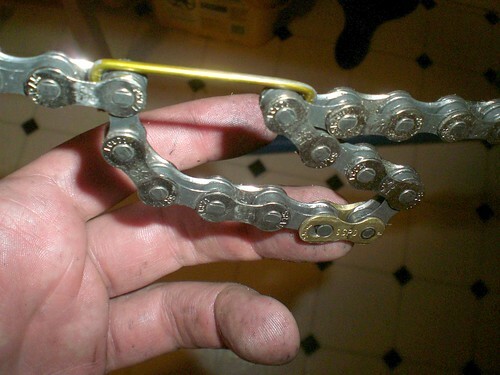 No more holding onto the greasy chain, chain tool, and turning the crank all at the same time. 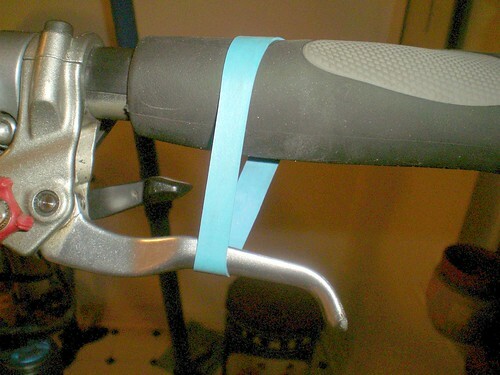 Second, use a strong elastic band to hold the brake lever when aligning disc brake calipers. I found this band on broccoli! They work great. They use some pretty good ones on asparagus, too.